BIKES, BURGERS & BEER IS BACK! Our second annual BIKES, BURGERS & BEER is coming up fast! Join us for the ride on Sunday, June 26th! A $75 donation will get you a burger, 2 beers, and you'll be helping Ray meet his Pan-Mass Challenge goal! Our Spring Reunion Ride is BACK! We're ready to kick off the season and eat some pancakes! It’s time for a FAMILY REUNION! 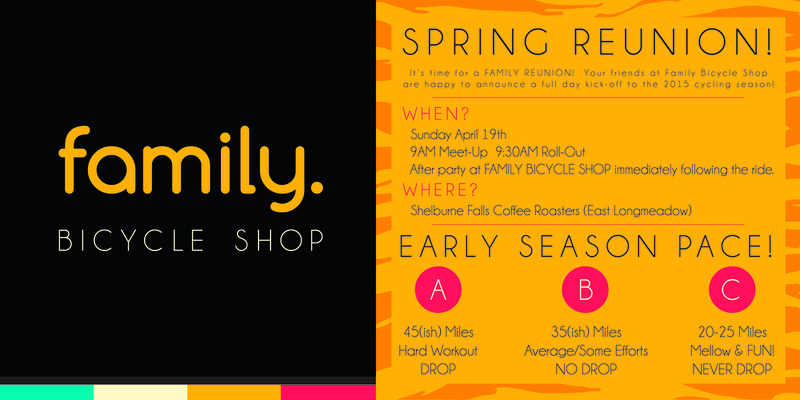 Your friends at Family Bicycle Shop are happy to announce a full day kick-off to the 2015 cycling season on SUNDAY, APRIL 19th!